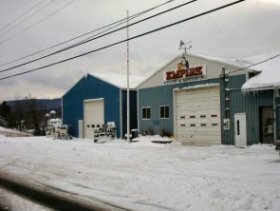 About Us | Empire Welding & Fabricating Co., Inc. Located in the Central New York Region you’ll find our shop nestled near the center of Virgil, New York. With our beginings as a small welding shop back in the early ’80s we have developed into what you see today. With the capability to do just about anything these days with our full line of equipment while taking care of the customers needs. Whether your parts are small or large, 1 to 1000′s, we can make it for you.